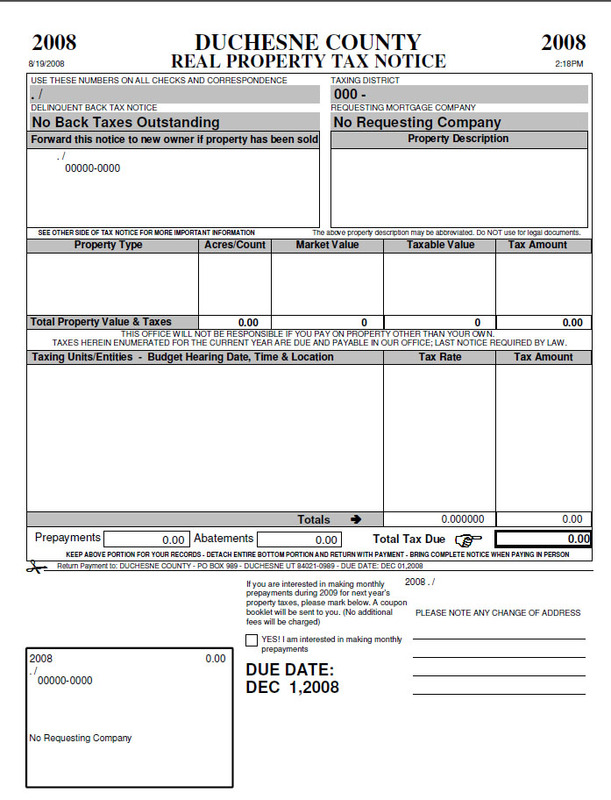 In CTxMS go to Assessor / UPP Reports / Tax Notices. To send the output to a text file, click on Text File. Make sure Single Notices is clicked off and that you have at least one UPP type selected, Personal Other, Mobile Homes, etc.. These are the same selections that are made if you are printing to paper. Change the Due Date & Interest Date only if necessary. 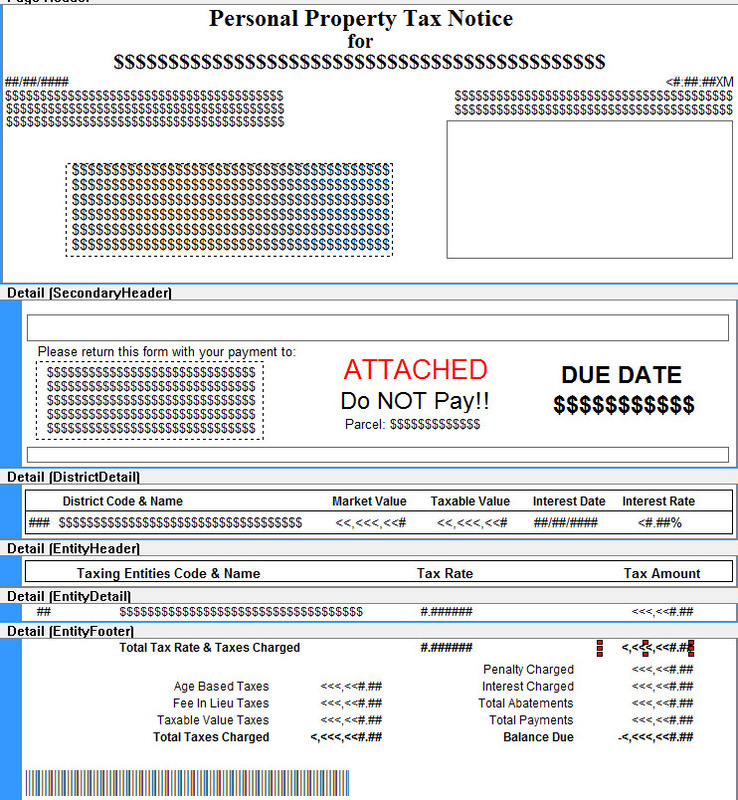 The BIG difference between paper output and text output, other than checking the box, is that the new interest and penalties that are calculated as you print are NOT saved when output is sent to a text file. This means that to update the master record interest and penalties, the tax notices to paper has to be run also. It is best to run it to text first then run the program to paper next. After gathering the accounts based on the criteria specified by the user, the Text File Output Dialog box will appear with the cursor in the File Name box. 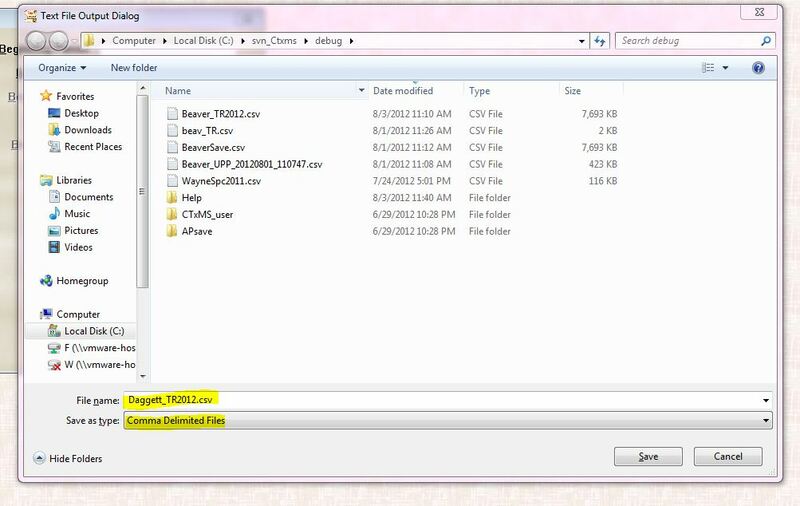 The file name field will be populated with a name that consists of the CountyName_UPP_Date_Time.csv This format will guarantee that the filename is unique. Always make sure you are saving to a Comma Delimited File as highlighted in yellow. This is the default and should not be changed unless there is a very good reason to. The upload process will reject a file if the extension is incorrect. After selecting a file, the program will generate the new data and send the output to the designated file. When the upload begins, you will see a message window indicating that the upload is in progress but there will be no progress bar. If there are any errors in executing the upload, the user will get a message on the screen indicating what the error was. It is important to either do a screen shot of the error or write it down and let us know what the error is. To send output to a text file, make sure that the fields that are highlighted in yellow are selected. 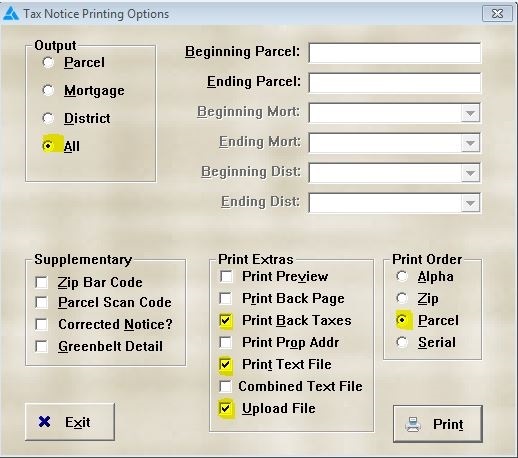 Under "Print Order", it does not matter which order is selected. After these 3 fields are selected click on "Print". The file is a csv with " " around every field except the first field of each line which is the line number. There could be fewer fields on this line than 6. The program collapses empty fields so that there are no blank lines in the address area. These next fields are split to be under either the report date or report time. Entity listing. There are 1 to n entities for each district. 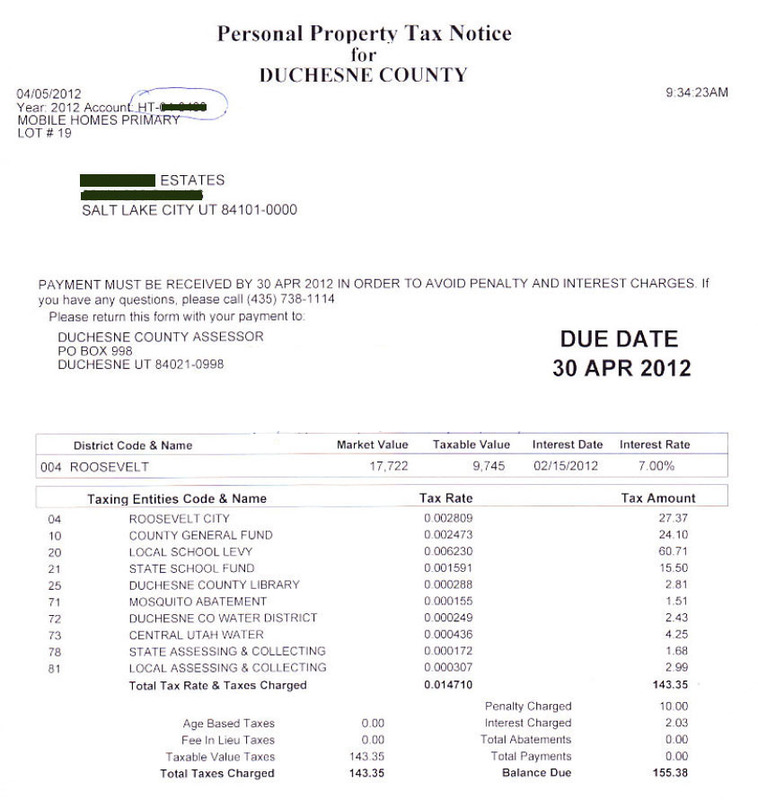 If the account is attached to a real property, then line 9 will have the strings filled else they will be blank. 9, "ATTACHED","Do NOT Pay!! ","Parcel: Real Property Parcel Number"